Downham Market Steam Mill named Eagle Roller Mills, was often known as Bird's Mill as along with Kings Lynn Boal Mill, it was once owned by the Bird family. The mill stood beside the railway with a level crossing on the road beside the mill. Jacob Bird was born in 1789 and ran Fincham_postmill for at least 20 years. 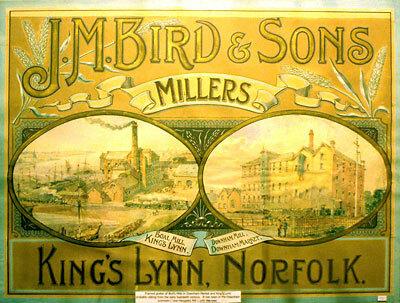 His son, Jacob Mason Bird, was running Hilborough_watermill in the 1840s and in 1848 he in turn had a son, Frederick Augustus Bird, who went on to run what became known as Bird's mill at Downham Market. My father's father was Frederick Augustus Bird (the F.A. Bird of the Downham Mill) and he was born in 1848 in the Hilborough Mill which was run by his father, Jacob Mason Bird. Jacob Mason's father was another Jacob and he ran the Fincham_Post_Mill. I had no idea of this until I looked at your website. This Jacob was born in 1789 and I have not managed to go any further back. I have just been browsing through the internet of pictures of Downham Market. 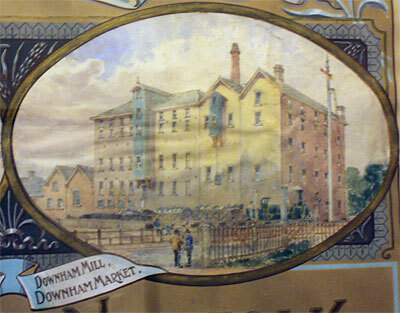 I was most interested to see pictures of Downham Mills. Especially so as my husband and I both worked there in the Office from 1957- 1962. We cannot remember the exact time of Peter Bird's father leaving work but we do remember that his brother Aubrey Bird moved to Wereham and took over running the Mill with the support of Frederick Mardell the General Manager and Paddy ???? Mill Manager. 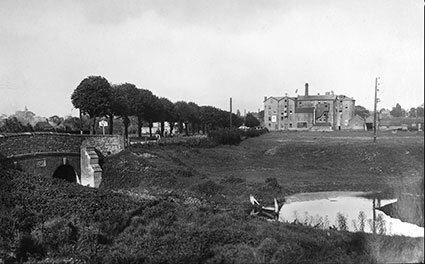 In about 1960 Aubrey sold the Mill to Heygates of Bugbrooke. Northampton, but he remained involved with the daily Management. Monday, September 3, 1917, dawned fine enough for 46 Squadron to make its first offensive patrol since returning to the front, the honour falling to A flight whose five Pups included Second Lieut Algernon Frederick Bird, late of the Norfolk Regiment. From memory, he thought they had covered their patrol area once and had turned to repeat the exercise when an enemy aircraft was spotted some way below. It was some time around 7.15am and the flight commander signalled his intention to attack. Algy followed and, on sighting another enemy machine, made a line straight for it. So far so good, but things soon went awry as more German fighters joined the “scrap”. In no time, the five Pups were heavily outnumbered and fighting for their lives. And an already dire situation was rapidly compounded by a case of mistaken identity that almost proved fatal for the 21-year-old Norfolk aviator. Unbeknown to Algy, the pilot of one of the ‘tripes’ weaving in and out of his slipstream was von Richthofen himself and, like his intended victim, he was just feeling his way back into action following his own brush with disaster. Having regained consciousness, Algy was doing his damnedest to throw off his pursuers as he powered towards the relative safety of British territory amid a hail of fire. “The two enemy triplanes were making wonderful shooting practice of me,” he wrote, “and my machine was being hit times without number, the splinters flying from the two small struts just in front of the cockpit, and from the instrument board. Such was Algy’s handling of his mortally damaged aircraft that Richthofen was under the mistaken impression that the Pup was being flown not by a novice but an experienced opponent, and it has been suggested that it was out of respect for his adversary’s courageous struggle that he uncharacteristically abstained from delivering the coup de grace. though the encounter did have a final surprising twist. 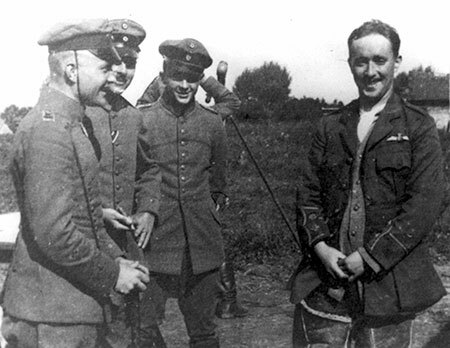 For having survived narrowly being lynched by German troops, Algy, his minor wound having dressed, found himself being greeted and filmed with Richthofen and the aircraft designer Anthony Fokker who happened to be visiting the front. Stills from the film show conqueror and victim both smiling, though probably with rather different thoughts in their minds. “Who could blame him?” says Algy’s son. “He was still alive, which was remarkable in itself.” Indeed it was. Out of the more than 80 airmen whose aircraft fell victim to the Red Baron’s guns only 29 lived to tell the tale. And there was, of course, one final irony attached to the unequal combat between plucky rookie and the war’s top gun: whereas Algy Bird, having survived the war as a prisoner, went on to live another 40 years, most of it spent running the family business in Downham, Manfred von Richthofen had less than eight months to live. Such mischance served only to underline Algy Bird’s extraordinary good fortune that 90 years on seems fully deserving of that annual celebratory glass of champagne to mark the anniversary of his famous joust with the Red Baron. Was most interested to see the article yesterday regarding Algy Bird. I began working in the office in 1942 and remember Mr Bird and Mr. Mardell the Secretary very well. I think it was in 1943 that the Steam engine suffered a broken crankshaft and sadly as it was a German Lanz machine a replacement could not be found. 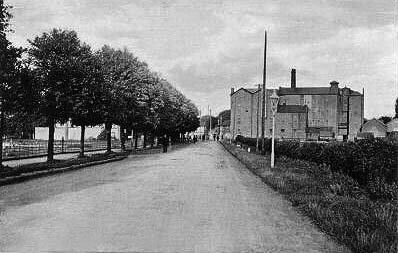 A decision was then made to change over to electricity for power and the old steam engine was removed and after many months of having to buy-in flour from neighbouring millers production was resumed. After electricity was installed the first task for me each morning was to go into the meter house and read the meters and this was checked against production each day.The water meter also had to be checked as the mill was now using mains water and not from the reservoir near the small river which was where the relief channel is now.The water for the steam engine had been drawn directly from this source. I left the mill in 1945 to join the RAF I am not sure when Mr. Bird died but his brother Aubrey who had an engineering works in Grantham came and ran the business for some time and the business was eventually sold to Heygates. I have many fond memories of my time at the mill and remember many of the characters who were working there at that time. I am now in a position to add a little to the narrative that you have already included on your website. Jacob Bird (Snr) was born in Sculthorpe, near Fakenham. He is mentioned in the Will of John Bird, a farmer of that parish, of which I have a copy. It would appear that Jacob was illegitimate and claimed by John Bird as his son for appearances sake as, by 1789, he was, by his own admission an old man. It is possible that Jacob was the illegitimate son of one of John Bird's real sons, Isaac, in true biblical fashion. Jacob's eldest brother was a butcher in Burnham Market, and his second oldest brother was a cabinet maker in King's Lynn. 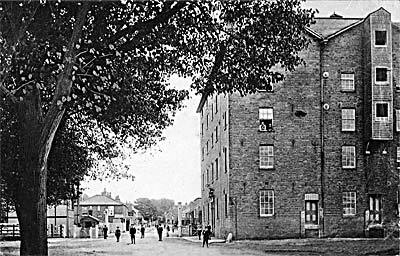 You might be aware that Bird's Mill in Downham Market is called the "Eagle Roller Mills". If anyone can enlighten me as to the significance of the eagle in milling I would be grateful. Clearly my great-grandfather, Jacob Mason Bird had a thing about eagles. Residents of Downham Market will know that the Conservative Club is at Eagle House, Bridge Street. This was the residence of Jacob Mason Bird when he moved from Hillingdon and where he died in 1894. Old flour bags from Bird's mill had an emblem of an eagle grasping a dolphin and the legend "Aquila non captat muscas" (eagles don't stoop to catch flies). The will of Mr. Jacob Mason Bird, of Downham Market, Norfolk, miller, who died on April 25th has been proved, the value of the personal estate amounting to upwards of £21,000. You may be interested in an advert I found in The Norwich Mercury dated 12 Aug 1848 referring to the Northwold Post Mill; at least it establishes that Jacob Mason Bird operated the Mill in 1848. Also, I noticed that Mr Bird's name cropped up a few times in Court Reports. 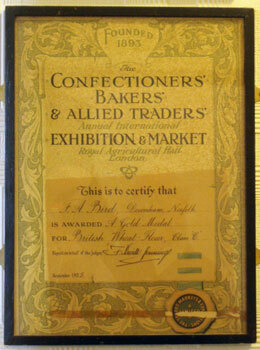 In 1858, he had trouble with a young man called Frederick Youngs whom he employed as a miller in Northwold. Youngs was convicted of theft of some flour, bran and sacks from his master and sentenced to 6 month's imprisonment and hard labour (The Norfolk Chronicle, 30 Oct 1858). In 1861, Mr Bird was sued for breach of contract to supply 5 tons of bran. The contract price was £5/10/0 per ton, and Mr Bird insisted on cash up front. The plaintiff, George Girling, Merchant of Great Dunham, gave Mr Bird enough sacks for the bran but no cash. When he chased up his order, the price of bran had risen to £7 per ton. He paid up and duly received his bran, but was seeking to reclaim the extra £7/10/0 it had cost him. The Court found in Mr Bird's favour with costs as reported by the Norfolk Chronicle on 20th April, 1861. More trouble with an employee in 1863: a clerk whom he employed in Downham Market called Frederick Woodmancey was convicted on four counts of embezzlement, all in the month of June that year, totalling a few pence over £50 (!!) - Goodness knows how he thought he would get away with it! - and was sentenced to nine months hard labour (The Norfolk Chronicle, 8 Aug 1863). Bird blamed his manager at Downham, Richard Curtis, for not spotting Woodmancey's shenanigans and for not keeping the books accurately; their relationship broke down completely by 3 Jul 1863. Curtis thought he was going to be replaced, so he enquired after a position in Westacre ... Mr Bird found out about this and on 23 Jul gave Curtis written notice to leave at the end of the that quarter of his yearly contract. Curtis protested that his contract required his employer to give him 3 month's notice. Mr Bird seemed to acquiesce: he directed Curtis to report for work daily at Downham from 6 Aug 1863 onwards (but he repossessed the horse and gig that Curtis normally used). Curtis did not report for work at all from 6 Aug onwards, but claimed a quarter's salary in lieu of notice (£47/10/0). Mr Bird opted for the case to be judged by a jury - which was composed of men of similar status as himself: four farmers and an inn keeper. The jury decided in his favour. The judge endorsed their finding and certified costs against Curtis (The Norfolk News, 19 Dec 1863). 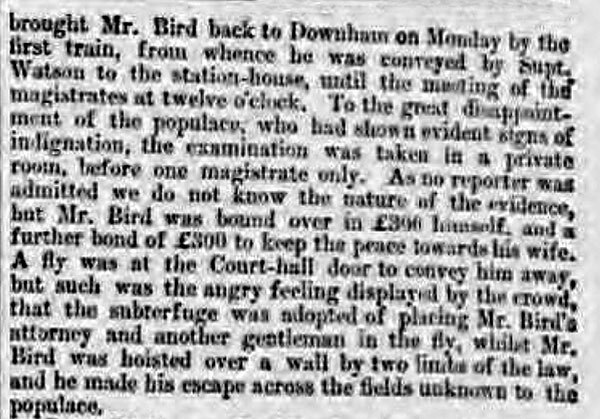 Bird took some road contractors to court in 1876 for failing to maintain the Nordelph to Downham road (The Norfolk Chronicle, 12 Feb 1876) presumably what is now Silt Road. The case was adjourned and there is no further mention of it. (I presume that the contractors fixed the road and compensated Mr. Bird for whatever damage his wagon/cart had sustained). 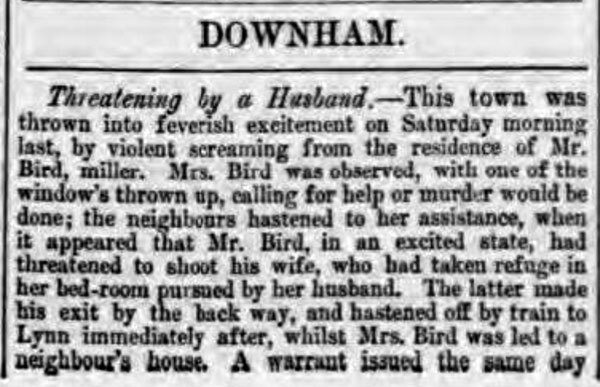 But Bird caused the greatest sensation in 1865: on Mon 15 May, he was charged at the local Magistates Court with using threatening language towards his wife. Early that morning, he had a row with his wife. The commotion drew the attention of their neighbours who protested at his behaviour; apparently he was threatening to shoot his wife. He skedaddled out the back door and took a train to Kings Lynn. A warrant was issued for his arrest. He took the first train back to Downham and was taken to the police station until the Magistrates Court opened at midday. To the frustration of the crowd, his hearing was held in private by one magistrate only. He was bound over himself for £300 with a further bond of £300 to keep his peace towards his wife. To avoid meeting the angry crowd at front of the Courthouse as he left, a couple of "limbs of the law" hoisted him over the back wall to escape across the fields back home. (Full report in The Norfolk Chronicle, 20 May 1865). Jacob Mason Bird died in 1894. His estate amounted to £21,000 (The Eastern Evening News, 25 Aug 1894). That amounts to £2.194 millions in today's money in terms of comparative Retail Price indices, 1894 and 2016 but a lot more if you factor in relative property prices.